Explore our quaint downtowns this winter and enjoy the warm and friendly faces that will welcome you to Lake Lure and the Blue Ridge Foothills. The following are some must see stops during the winter months you don’t want to miss. Bennett Classic Car Museum | The Bechtler House and Mint Site | Bostic Lincoln Center | KidSenses Interactive Children’s Museum | Washburn General Store | Blue Ridge Distilling Co.
One of the best ways to get acquainted with our area is to take off on one of our scenic driving tours. The one we recommend during the winter season is our Cherry Bounce Trail. This back roads tour comes from an old moonshine route taken by those in search of Amos Owens’ famous Cherry Bounce drink made from the sweet cherries of Golden Valley. Depending on when you arrive to our area, the tour can take anywhere from an hour and a half to five hours, if you get lost in the nostalgia you find along the way. The tour, which originates in downtown Rutherfordton, transports you back in time as you explore historic markers dating back to both the American Revolution as well as the Civil War, visit Blue Ridge Distilling Co. set in heart of Golden Valley, Washburn General Store, one of the oldest, family run businesses in North Carolina, the Bostic Lincoln Center, a museum dedicated to President Abraham Lincoln, and lots of other hometown favorite spots. It’s a great way to learn about our area and get a sneak peek at some of the stops we recommend throughout your stay. Upon your return to Rutherfordton, grab a seat at Mi Pubelito Mexican Restaurant, a local favorite for lunch or dinner that always feels like a party. Begin your day with breakfast at The Olive Tree. A Greek restaurant that will pleasantly surprise you with home made potatoes, plentiful omelets, and a southern take on biscuits and gravy that even the locals approve of. 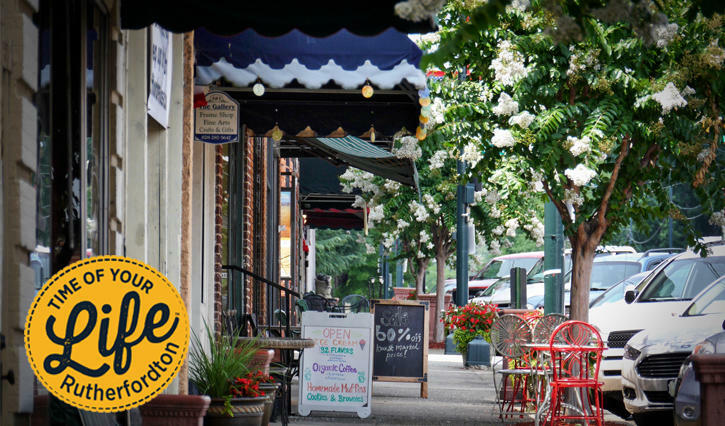 Next, stroll the streets of downtown Rutherfordton. 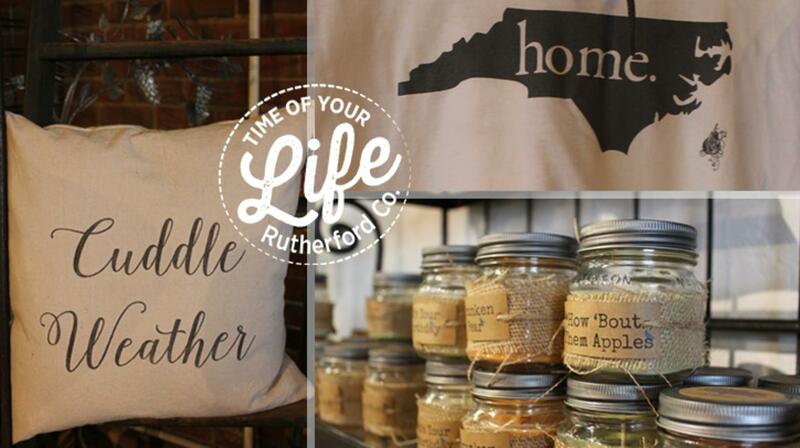 Named 2016 NC Small Town of the Year by the NC Rural Center, Rutherfordton provides a number of activities such as shopping, historic walking tours, and heritage displays. Local boutique shops include Paws and Purrs, the perfect place to find a something for your furry friends, Hills Hardware which includes a wide range of shopping items such as local t-shirts, hand made wooden toys, and 925 To Go jewelry shop on the top floor. The VAC is an art store featuring unique pieces from local artists. They have a wide range of items including pottery, glass work, jewelry, area photography and paintings. Across the street you will find The Gallery which contains a great selection of beautiful items that make perfect gifts. If you are already in love with our quaint town, take the Historic Downtown Walking Tour to learn more about the area and the history that surrounds you. You can pick up a map at the Welcome Center in Rutherfordton, or download one online at RutherfordtonTrails.com. Traveling with kids? We have you covered. KidSenses Interactive Children’s Museum is a top rated attraction for the little ones. Interactive exhibits encourage imagination and adventure around every turn. You can also explore the Main Street Safari Trail that begins at KidSenses or Kiwanis park and takes kids on a journey through time and history. They can even earn points and prizes through the Kids in Park program. Take time out for lunch at Rutherford Thai. Featured in Our State magazine, it provides a serene atmosphere and some of the best Thai food you can find. After lunch stroll up to 6th street and visit The Bechtler House, home of Christopher Bechtler who minted America’s first $1 gold coin and operated one of the most successful private mints during the NC Gold Rush. After taking the house tour, drive up to the Bechtler Mint Site and Historic Park to see the famous “Hidden Floor of Gold”, a cutting edge invention of Bechtler’s that allowed him to collect gold dust off the feet of his visitors to the mint. Afterwards cruise on down to Spindale. 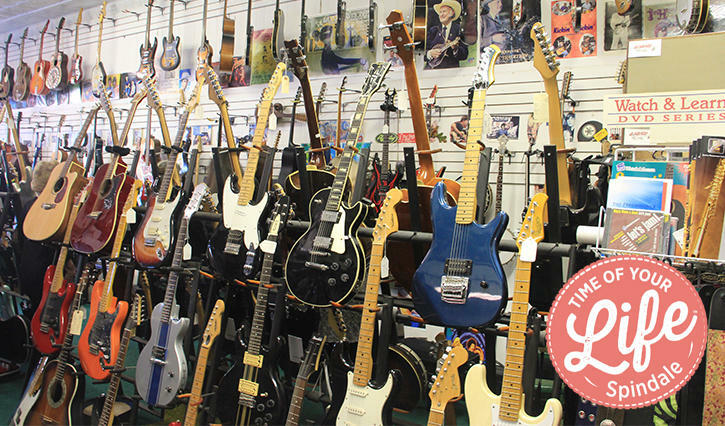 If you get there early enough, catch an afternoon jam session at BSharp Music. Make sure to stop in at Spindazzle and browse their array of clothing, jewelry and home decor items. The selection is so great, you may have a hard time picking out your favorite item. Downtown Spindale comes alive at night and is a local hot spot for music and food. Stop in to enjoy dinner and possibly some local music at Barley’s Pizzeria and Taproom. Their voodoo wings are some of the best you will ever taste! Meet some of the locals while enjoying a southern cooked breakfast at The Fountain at Smith’s Drugs in downtown Forest City. Discover southern favorites such as liver mush and country ham along side a big ole heaping of grits. While downtown, discover local finds in the quaint shops that line Main Street. Puzzle Creek is an outdoor enthusiasts one stop shop for gear and supplies. Mirror Mirror offers trendy items for your home while The Twisted Pear serves up the best selection of craft beer in the county in easy to take home packaging. Looking for some souvenir gifts to take back home? Check out the wide selection at Burnt Chimney Mercantile. As your appetite beckons, head to Louie’s Cafe on Broadway for a slice of authentic NY Pizza. That’s right, NY Pizza right here in North Carolina. Our next stop is Bennett Classic Car Museum. This museum has a huge selection of classic cars including Barney Fife’s police car from the Andy Griffith Show. Think back to simpler times as you admire the craftsmanship and details that went into every car. Afterwards stop in Banfield Pottery Studio and admire handmade local pottery, uniquely crafted with whisky mash from Blue Ridge Distilling’s Defiant Whisky. 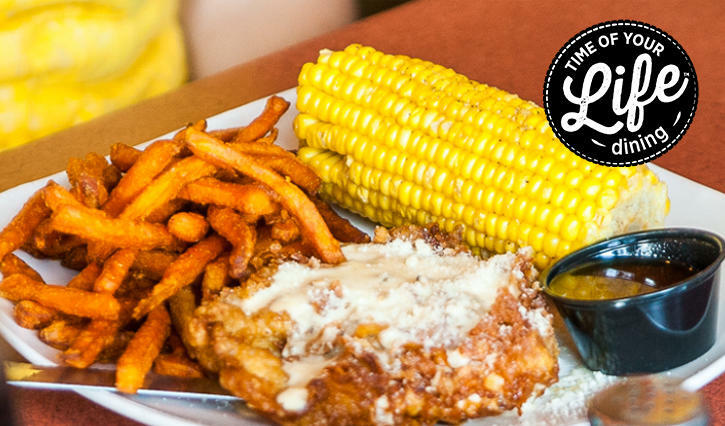 End your evening with a sampling of delicious choices offered at Copper Penny Grill. Don’t forget to try their shrimp and lobster bisque. It is to die for! 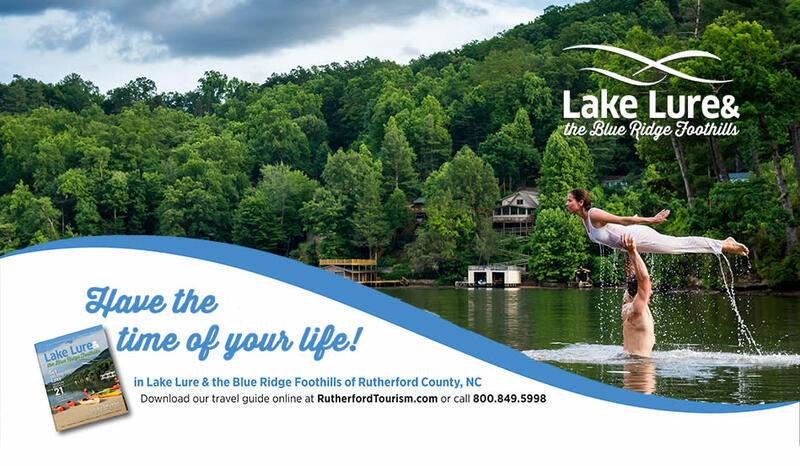 We hope you have enjoyed your visit to Lake Lure and the Blue Ridge Foothills. Come back and visit us this spring or summer and explore the other end of the county where we have the best in water sports, bouldering, hiking and zip lining as well as beautiful Chimney Rock State Park.